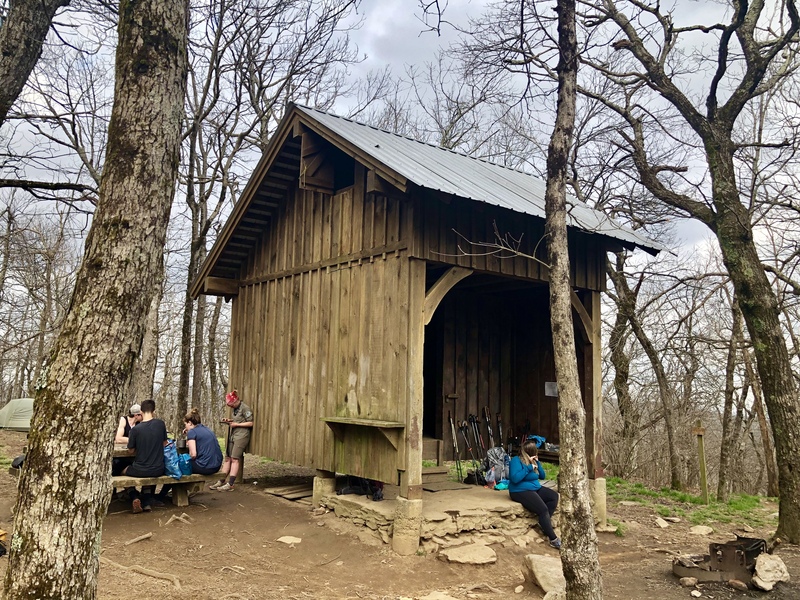 Amicalola Falls State Park to Springer Mountain Shelter: Nine miles hiked. A few weeks before I left home to begin hiking the AT, my mother, Vicki, decided to come along and hike with me for the first week. My husband, Tom, had graciously agreed to drive us from Illinois to Georgia, and the three of us had an easy trip down the day before we started out. We slept well the night before at a nice little motel in Ellijay, GA, called the Stratford Motor Inn. After a tasty dinner at the Mexican restaurant across the street, we picked up a six-pack of brews to share. We spent the rest of the evening relaxing in our room, trying to not get too nervous for what was to come the next day. 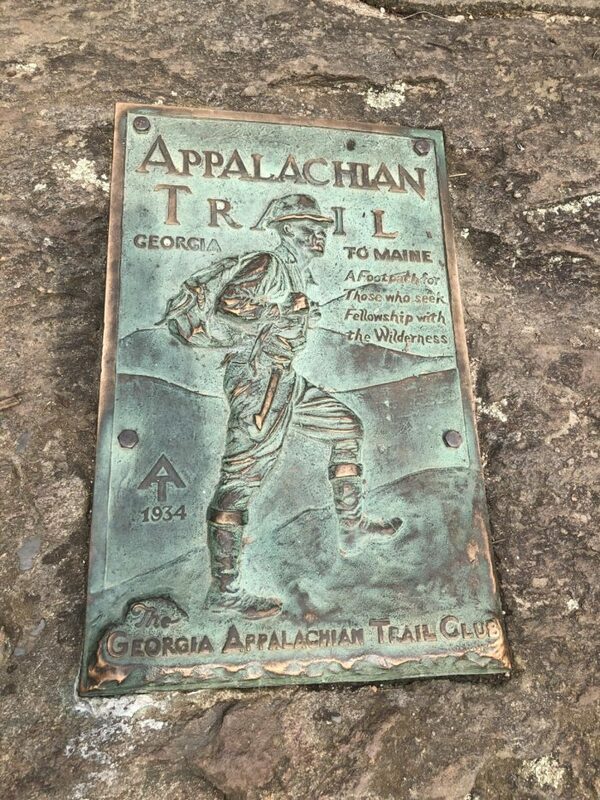 After waking up and doing a final gear check, we set off for our starting point at Amicalola State Park. Mom was a little nervous, but my pretrip anxiety had been replaced by pure excitement. We arrived in time to see a demonstration on the best method of hanging a bear bag (PCT style), signed in at the ATC office, and had our packs weighed on their scale. 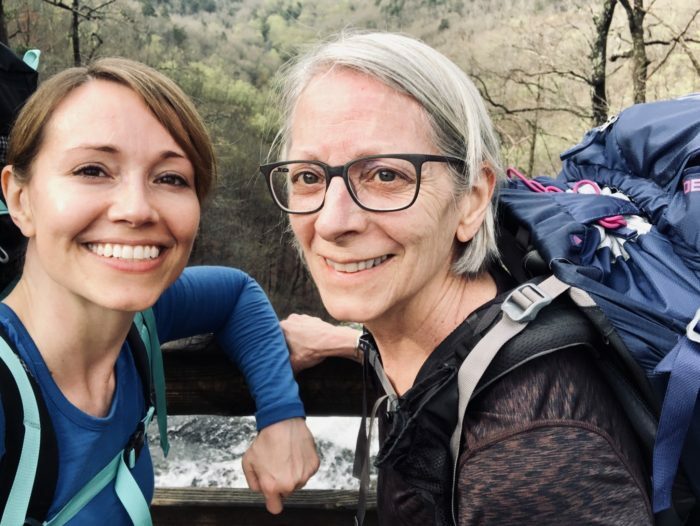 I started with my pack at 35 pounds; my mom’s came in at 32. Although this weight did include two liters of water, five days of food, and trekking poles for each of us, let me tell you it was still too heavy! We took our starting picture, and proceeded up the Approach Trail. 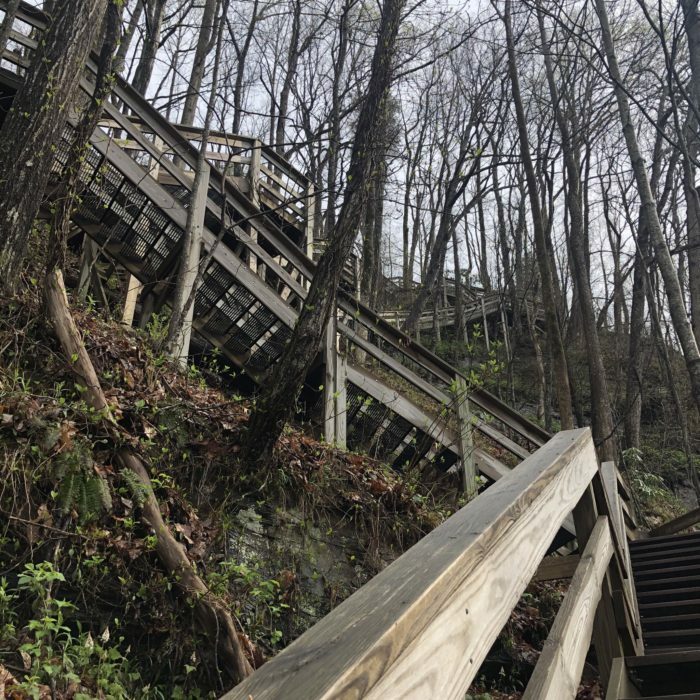 It began directly behind the visitors center and started with 650 steps to the top of Amicalola Falls. Tom walked with us until we had made it about halfway up the steps. I didn’t want him to leave, but we both knew it was time to go. After a final kiss and hug goodbye, he turned around while Mom and I proceeded up. And so up we went, and then up some more. At this point my mom gave me a look and I knew what she was thinking. In case there was any doubt, she confirmed my suspicion when we got to the top: “Those steps really sucked.” The view from the top of the falls really was beautiful, but we didn’t linger. After a quick photo we continued on (up) and soon entered the forest. The weather at this point was great, with temps in the mid-60s and clear skies. After a few hours of ambling along, we stopped for lunch at a sunny spot and it felt great to take our packs off for a while and rest. Spring wildflowers were blooming, and we saw several unfamiliar varieties of songbirds, as well some interesting fungi and insects. 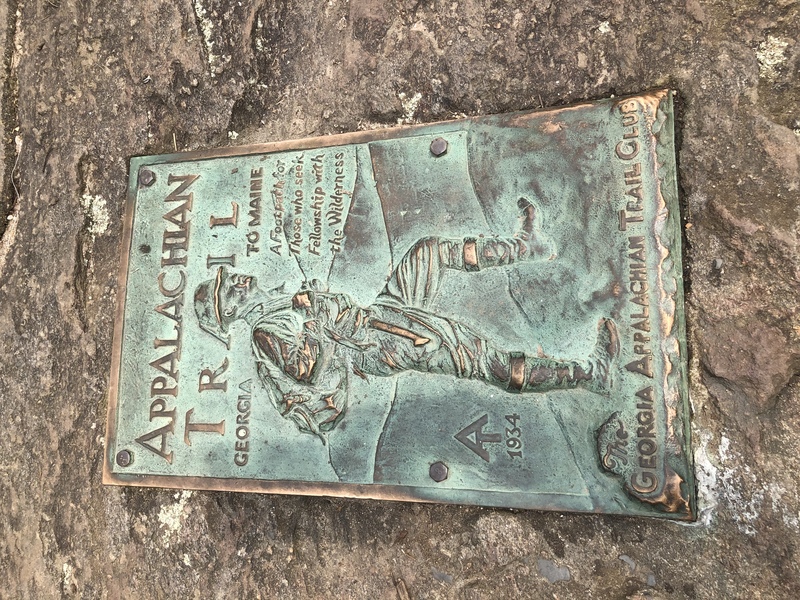 The Approach Trail finally ended at the top of Springer Mountain after 8.8 miles. The final mile up to the summit of the mountain was strenuous, but we pushed on and it was an amazing feeling of relief to make it to the spot that marked the official starting point of the AT. 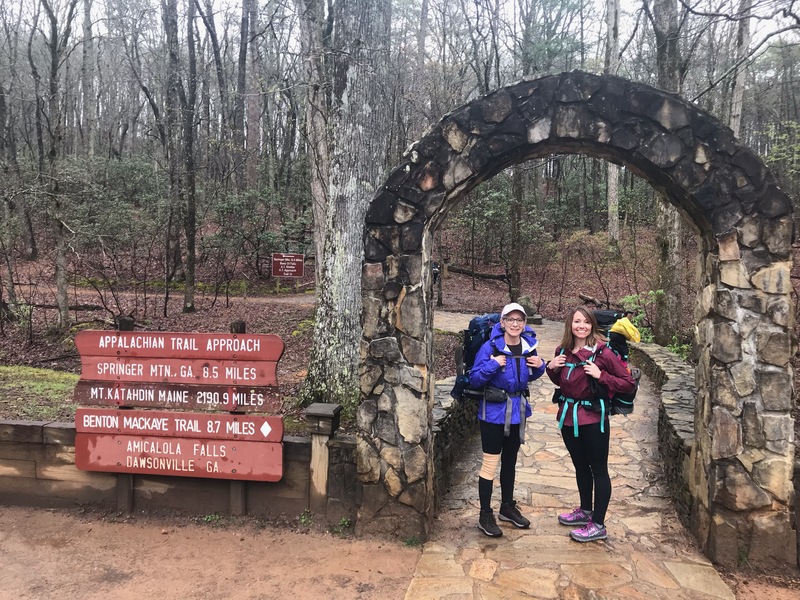 We signed in at a trail register hidden in a large rock under the AT plaque, snapped a few pictures, then continued on another quarter mile (downhill, yay!) to our camping spot. We arrived at Springer Mountain Shelter at 5 p.m., seven hours after setting out that morning. We were lucky and snagged two of the last three remaining shelter spots. There were already several people milling around and cooking dinner at a picnic table, and since we were hungry again no time was wasted in gathering and filtering water to boil water for our dehydrated dinners. The shelter area was a happening place to be. We spent the next couple of hours chatting with other hikers, and watching more people arrive and set up their tents and hammocks. In total, six people were set up on the top floor of the shelter, with six more people—including us—on the main floor. Twelve to 15 tents and hammocks were set up around the shelter area so there were quite a few people around. By 8:30 p.m. it was dark, and with everyone tired from the first day’s hike it was time to go to bed. We were packed in tight inside the shelter, sleeping pad to sleeping pad/shoulder to shoulder. It began to rain right after we were in our sleeping bags, and soon there was lighting and thunder giving us quite a show. Due to the storm, I was very glad I had a spot in the shelter for my first night on the trail, even though several snorers shared the same small space (pro tip: bring earplugs!). Thus ended our first day on the trail. The steps and the hike up Springer were a challenge, but we felt great at achieving our first goal. Stay tuned for day two and day three write-ups tomorrow. Hello friends! My name is Steph D and I'm an avid hiker from the flat prairie lands of central Illinois. No longer content to live vicariously through the trail blogs of other hikers, I'm hitting the trail solo in March 2019 at Springer Mountain, Georgia and heading north towards Katahdin, Maine. I'm somewhat overpacked, a bit under-practiced, and more than a little afraid of being attacked by shelter mice. Exciting times lay ahead and I'll be keeping it real - so follow along on my AT journey! Awesome! Keep these blog posts coming! Amazing! Looking forward to following along. Enjoy! You girls are amazing!! Very proud of both of you!! Hugs from home!